Global demand for geosynthetics will rise 6.1 percent annually through 2019 to 6.5 billion square meters. Growth will be driven by China due to its ongoing large-scale infrastructure projects and need for erosion control. Further bolstering world demand will be growing concerns about environmental protection. 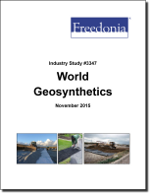 This study analyzes the 4.8 billion square meter world geosynthetics industry. It presents historical demand data (2004, 2009 and 2014) and forecasts (2019 and 2024) by type (e.g., geotextiles, geomembranes, geogrids, geonets) and market (e.g., construction, transportation infrastructure, landfills, liquid containment) for six world regions and 19 major countries. The study also considers market environment factors, details industry structure, evaluates company market share and profiles 36 industry players, including Royal Ten Cate, GSE Holding, and NAUE.